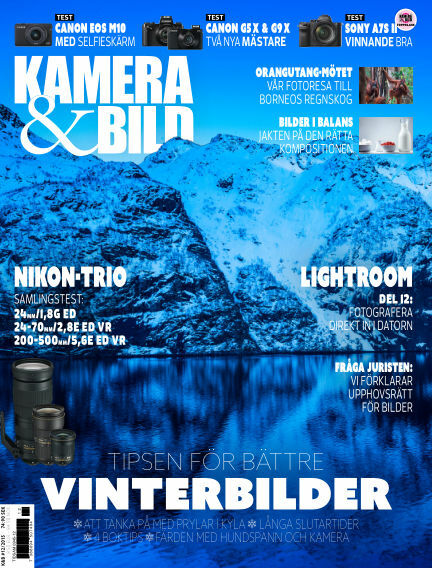 In this issue of Kamera & Bild : Tipsen för bättre vinterbilder. Följ med på fotoresa till Borneos regnskog. Test av tre Nikon-objektiv. Fyra kameror testade: Sony A7S II, Canon PowerShot G5 X och G9 X, Canon Eos M10. With Readly you can read Kamera & Bild (issue 2015-12-01) and thousands of other magazines on your tablet and smartphone. Get access to all with just one subscription. New releases and back issues – all included.